I designed Hiroshi for a design contest hosted by Amigurumi Patterns, which had as a theme create an amigurumi animal in a working outfit!! I was very excited to participate!! There were many cute and beautiful designs entries and I fell in love for many of them!!! 2. Hiroshi measures 18cm (7 inches) from ears to feet. 3. For sewing the pieces together you will use the tapestry needle. 4. His eyes, nose and mouth are made of felt. 5. His whiskers are made of wire painted with white oil paint. 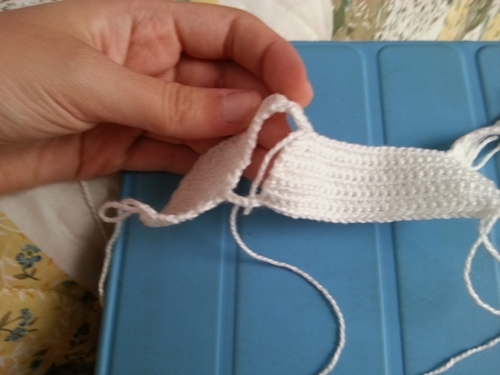 – Head (4mm “G” Hook) Use the white fluffy yarn and the white thin yarn to help you see the stitches. 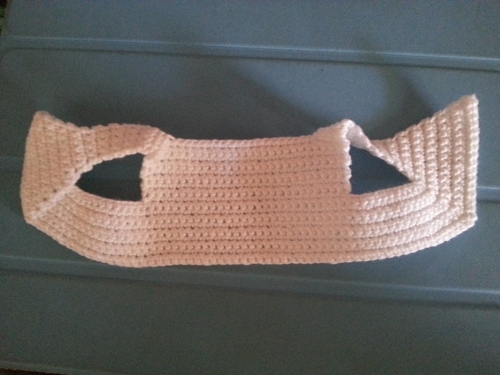 – Ears (4mm “G” Hook) Use light brown fluffy yarn and a light brown thin yarn to help you see the stitches. Finish off and leve a long tail for sewing. 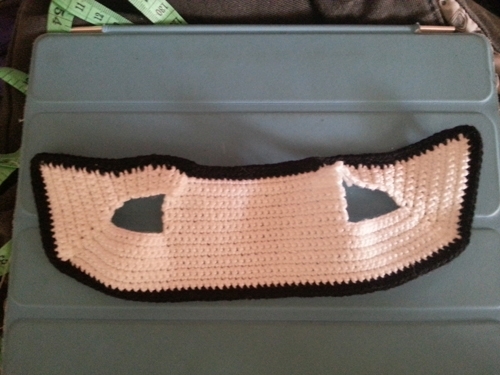 – Muzzle (4mm “G” Hook) Use the white fluffy yarn and the white thin yarn to help you see the stitches. 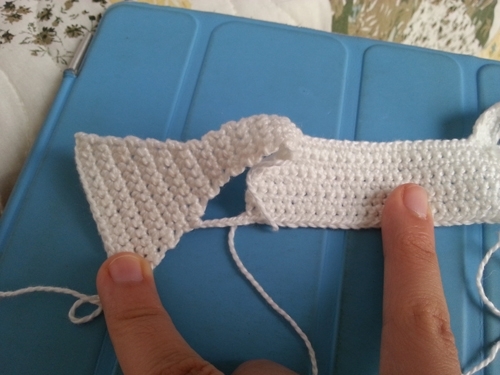 – Body (4mm “G” Hook) Use the white fluffy yarn and the white thin yarn to help you see the stitches. 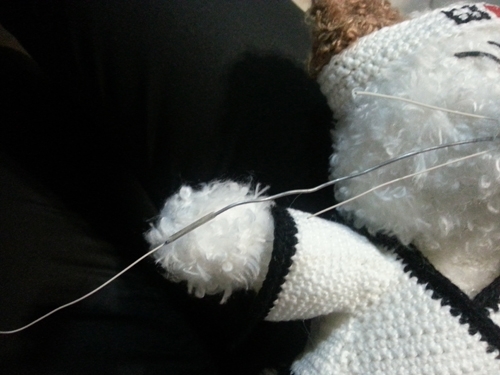 – Arms (4mm “G” Hook) Use the white fluffy yarn and the white thin yarn to help you see the stitches. Only stuff his hands with fiberfill. 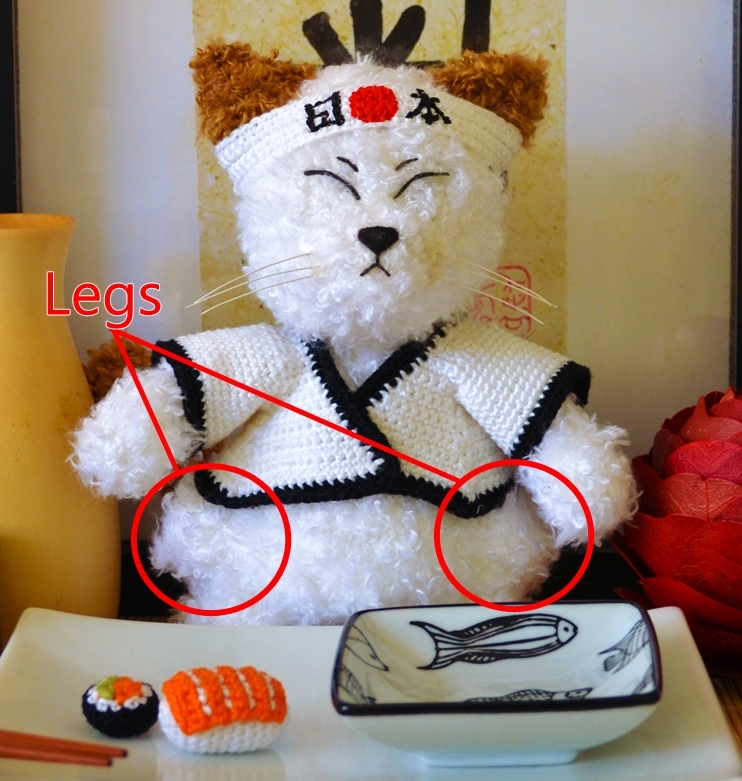 – Legs (4mm “G” Hook) Use the white fluffy yarn and the white thin yarn to help you see the stitches. – Feet (4mm “G” Hook) Use the white fluffy yarn and the white thin yarn to help you see the stitches. – Tail (4mm “G” Hook) Use the white and light brown fluffy yarn and the white and light brown thin yarn to help you see the stitches. Start with the ligh brown yarn. 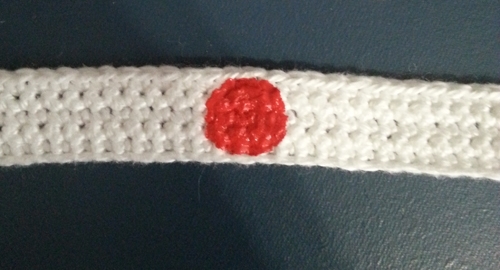 – Headband (1.75mm Hook) Use white 100% cotton thin yarn. 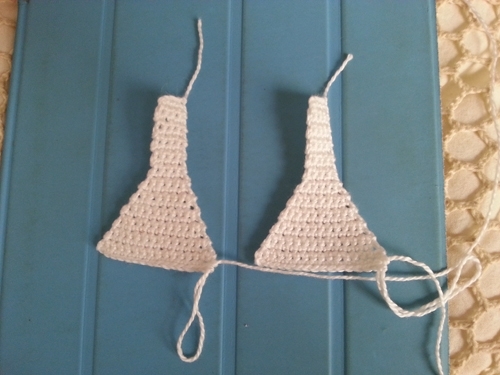 – Kimono (1.75mm Hook) Use white 100% cotton thin yarn. 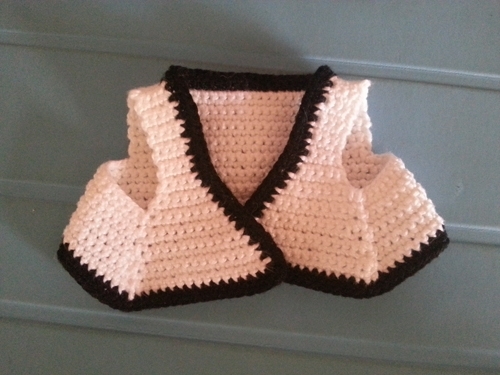 The two pieces of the front of his Kimono finished. After that, you are going to crochet the back. sc in the 4 ch on the top of the left side, then ch 20. Row 1: Attach the yarn between the 8th and 9th Row couting from bottom to up. Then, ch 12, sc in the back part of the kimono and ch 12 again and attach the yarn with a sl st in the other part of the front of his kimono. Attaching with a sl st.
Row 2: crochet a sl st in the next stitch and then ch 1, turn and crochet a row. sl st in the next stitch. 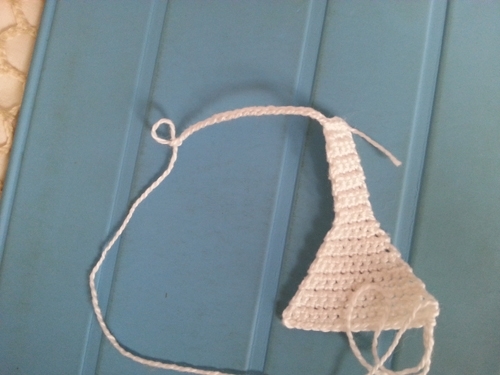 Ch 1, turn and crochet a row. Row 3: Crochet two sl st in the nearest stitches and then ch 1, turn, and crochet a row. Row 4-9: repeat the same of row 3. Attach the yarn into the first stitch of the fronton the bottom of the kimono. Make two rows. 1. Attach the yarn in the hole that it will be the sleeve. 2. Make 10 Rounds with 35 sc each. 3. After that, make two rounds with black yarn. – Salmon Sushi (1.75mm Hook) Use 100% cotton thin yarn. Sew some white yarn to make the white lines of the salmon. 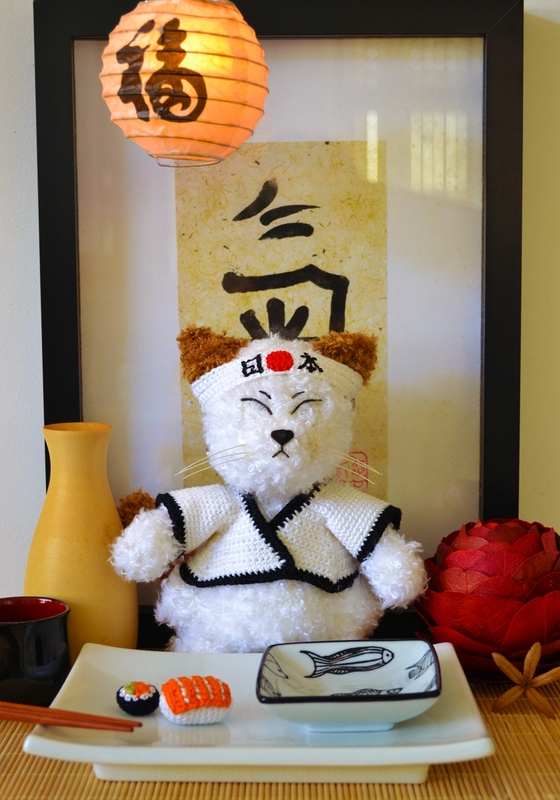 – Salmon Hossomaki (1.75mm Hook) Use 100% cotton thin yarn. 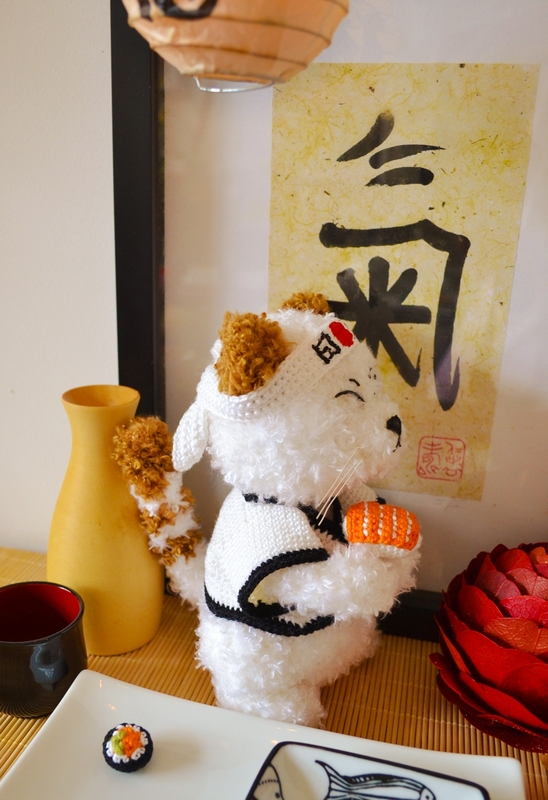 Sew some green yarn to make the green part of the hossomaki. Legs sewn to the sides. It is written “Nihon” in his headband, which means Japan. – First pick some amount of thin wire (I used some telephone wire). – Use white oil paint to paint it and wait it dry. 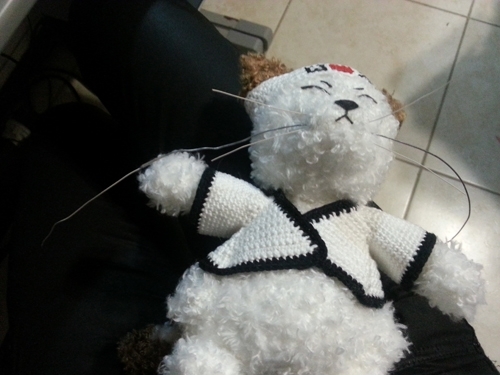 – After that, cut three pieces of wire long enough to make his whiskers from one side to another. – Use some glue to fix it. 10. Put some stitches in his kimono to keep it closed. This Character and Pattern was created by Ana Amélia Mendes Galvão. 6. You may sell any item made from this pattern. Thank you thank you very much share this pattern for free. He is so cute! I had to crochet it! Aaawn! I’m soo glad to know that!! That’s such a coincidence! 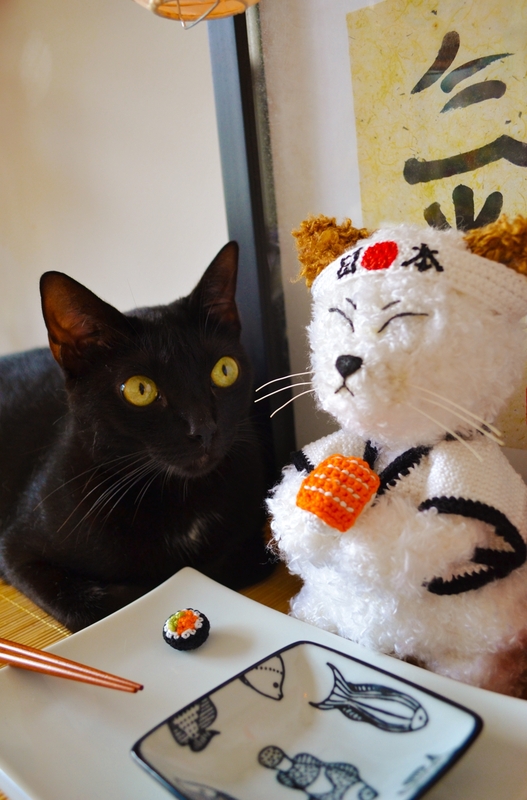 ^^ I would love to see your hiroshi, when you finish crocheting it :D You are very welcome! He’s so fuzzy. He’s so cute!